While humidity isn’t exactly what most of us enjoy, that doesn’t mean that it’s necessarily bad. In fact, some moisture in the air can be good for you. It is definitely good for your baby, especially since you can’t use a lot of different products to help them deal with dryness. The right amount of moisture in the air will prevent their skin and nasal passages from drying up, ensuring that they’re always comfortable and in great shape. If you live somewhere that gets really dry from time to time, finding the best humidifier for your baby is a must. These devices will help add some comfortable moisture to the air your little one inhales. So, if you often experience very dry skin, sinuses, throat, and lips during the cold months or when you use the A/C for long periods of time, you should definitely consider getting one of these products before your baby experiences the same discomforts. 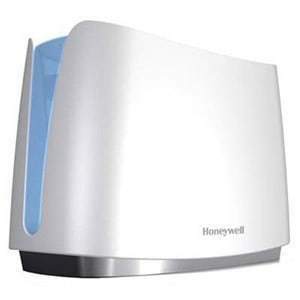 Kicking off the list is one of the most popular evaporative humidifiers: the Honeywell HCM350W. Crafted with the germophobe in mind, this device promises to not just add some moisture to the air in your baby’s room, but also ensure that the mist it releases is clean. This product has two key features. The first is its UV bulb that kills germs and pathogens without raising the temperature of the unit and needing to boil water to create steam. Next is its wicking filter, which makes it possible for the unit to make water evaporate without relying on high heat. What's Great About It: What makes parents love this product is its ease of use. The water tank is removable, so you don’t have to lug the entire unit to a tap. As it also has a wicking filter, it can easily handle hard water, so you don’t have to get distilled water to use with the unit. Cleanups are a breeze, too, so you can be sure that it won’t be a breeding ground for things that can harm your little one. If your baby gets fussy because of the dry air in the cold months, the Vicks Starry Night is something you should closely consider. As the brand is best known for its soothing rubs, it shouldn’t come as a surprise that its signature offering "rubs" off on its line of humidifiers. Its effectiveness, combined with its extra features, will really ease your kids into getting the rest that they need to recover from the cold, croup, or irritation that has been making them uncomfortable all day long. What's Great About It: Despite its simplicity, this product has a lot to offer. For one, it comes with a Vicks VapoPad™ Scent Pad Heater that will emit a soothing, non-medication aroma to help your little one relax, and even breathe better in some cases. As it also can self-regulate its evaporative system, you won’t have to worry about it increasing the baby’s room too much. It also has a projector, so aside from the moisture, it also soothes your child with fun and relaxing light images. 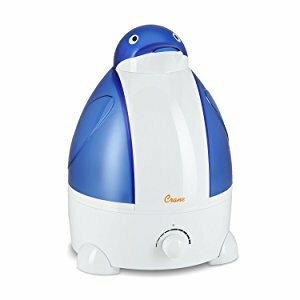 Crane USA's Adorable Ultrasonic Cool Mist Humidifier is designed to fit right into your little one's youthful bedroom. Equipped with multiple speed settings, you can be guaranteed that the Adorable Ultrasonic does a great job in increasing the air moisture in your child’s room. As it doesn’t require a filter if you use distilled water, you won’t have to worry about replacing anything or having an additional part to clean. It also has a night light, so in terms of functionality, this product is quite loaded. What's Great About It: Despite being a cool mist humidifier, this product didn’t stop there in ensuring its users’ safety. With its auto shut-off feature that is easily triggered by high temperatures and lack of airflow, you don’t have to worry about keeping this device plugged in all night long. It also uses antibacterial materials, so you can rest assured that pathogens won’t call this humidifier their home. 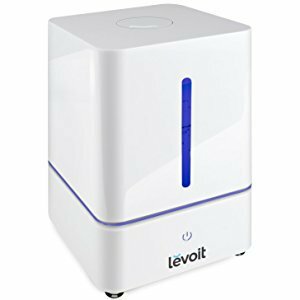 The Levoit Cool Mist Humidifier may not exactly be marketed towards very young children, but its features are perfect for helping kids stay healthy. This humidifier, diffuser, and night light device is actually considered to be a beauty device, so maybe Mommy and baby can share, giving you more bang for your buck. A few things that I love about this unit include its large water capacity so you won’t have to constantly refill the unit to keep the moisture at its ideal level and its single button control that will let you select your desired setting without a hitch. Its ultrasonic technology and easy-to-clean design also make it a great pick. What's Great About It: The Levoit Cool Mist may be the perfect choice for your child because of its double filtration system. It makes use of ceramic and activated carbon filters to ensure that the air in your kid’s room is clean, minimizing their risks of contracting diseases. 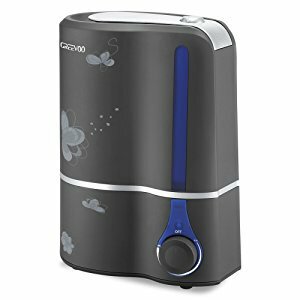 Another large-capacity humidifier that you should consider is the Greevoo Ultrasonic Cool Mist Humidifier. This new player has gotten quite a few rave reviews, so it might just turn out to be the perfect pick for your little one, as well. This ultrasonic humidifier can effectively add moisture to the air in medium-sized rooms. Thanks to its 360-degree mist outlets, it can effectively distribute mist around your little one. Its large tank also means hours of continuous misting without the need for refills in between. What's Great About It: Also equipped with a HEPA filter, this humidifier can easily double as an air purifier. Topped with a very friendly price, it might be just what your little one’s bedroom needs. The TaoTronics Cool Mist Humidifier is a good option for you if you struggle with trying to guess the actual humidity levels in your child's bedroom. This product has a digital display that will let you select your desired settings with ease. A few button presses will let you configure the amount of humidity it will emit and control the mist level it will release. On top of all that, its sleep mode, 360-degree rotatable nozzle, and ultra-quiet ultrasonic technology make it a great choice for babies. What's Great About It: With a built-in air purifier, you’re getting more than just a humidifier. Not only will you enjoy more moisture in your air, but you also won’t have to worry about the air quality your little one inhales, as this unit cleans it up effectively for you. 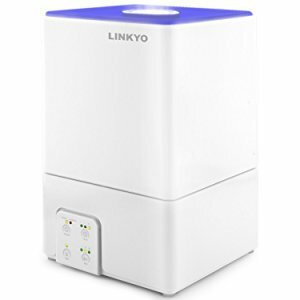 If you want to put your humidifier in a relatively large room, then Linkyo’s Cool Mist Humidifier is ideal. This product has a 4L water tank and can emit cool mist in over 2 feet, making it a good choice for living rooms and other large areas in your home. What's Great About It: There are actually two things that I absolutely love about this item. The first one is its sleek, modern, and minimal appearance that won’t distract from your interior styling. The other is the fact that you have full control of what it can do. It has dedicated buttons for different functions, letting you select the setting you prefer with great ease. Aside from the mist levels, it also has an auto shut-off timer that will let you control the duration of its operation. 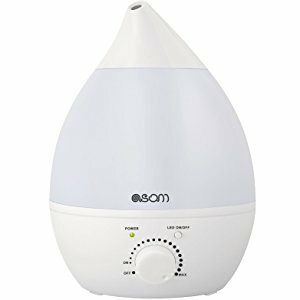 Another solid option for medium to large rooms is the Asom Ultrasonic Cool Mist Humidifier. This 3-in-1 device is a humidifier, diffuser, and night lamp in one neat package, making it a convenient choice for those who want to get the most out of their devices and purchases. As it promises a longer mist stream, it can cover more area, making it suitable not just for your baby’s bedroom, but also for master bedrooms and even living rooms. What's Great About It: Aside from its several mist level settings, 360-degree nozzle, and diffuser feature, I also like the separate LED light control button for this product. This means that you can easily turn its night light on and off whenever you feel like it without affecting the humidifier’s performance in any way. It also shuts off automatically when the water levels are low, or when the water tank is detached, so it is a pretty safe option for many homes. 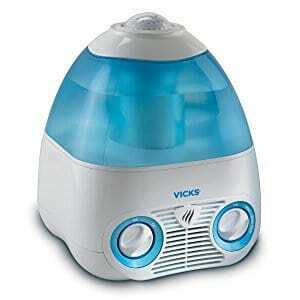 Humidifiers have been around for ages; it’s just that not many people pay attention to them. Nowadays, however, with easier access to information, we already know just how beneficial these things can be for one’s health. In fact, a lot of parents consider these devices to be necessities to keep their little ones in top shape. If you’re still on the fence about humidifiers for babies, let this guide give you a quick rundown of what these devices have to offer. There are lots of things that can affect the quality of air inside a building. Combine this with very little humidity, and it can definitely trigger an adverse reaction in very young children. A simple case of dry skin can lead to infections that can cause lasting problems. Breathing in dry air can also lead to irritation of the nasal passages, leading to extreme discomfort for a baby. The discomfort it can bring a small child can be unbearable as well. Since kids don’t handle stress effectively, their development can also suffer. This one small device can help deal with a problem that can potentially endanger your little one’s well-being, so you shouldn’t really think twice about it. When shopping for humidifiers, you’ll have to choose between warm and cool mist humidifiers. ​As their names suggest, what sets them apart is the temperature of the moisture they emit. In addition, humidifiers are also classified according to construction and their mist source. A good amount of commercial buildings have central humidifiers. Steam vaporizers are also some of the most common and easily available humidifiers for kids and small rooms nowadays, as they’re cost-efficient and portable. 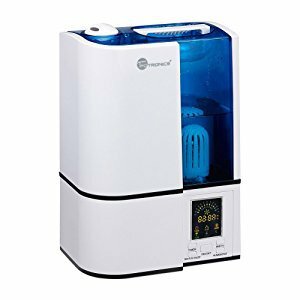 You can also find evaporators, impeller humidifiers, travel humidifiers, aromatherapy vaporizers, and ultrasonic humidifiers that make use of different sources and techniques to add moisture in the air. If there’s one thing you shouldn’t compromise on when it comes to your baby’s humidifier, it is its cleanliness. As it produces humidity, you have to make sure to clean it completely so you can prevent mold growth. For this, you’ll want to own something that’s easy to clean, so you can be sure that you’re doing a good job of maintaining the unit. Anything with unreachable nooks and crannies should be avoided. Aside from cleaning, most humidifiers also require regular maintenance. Some units need filter replacement every so often, making them too tedious to own. This is why some parents recommend opting for ultrasonic varieties that don’t require a lot of upkeep. The best humidifiers won’t ask you to slave away just to keep them in perfect running condition, so make sure to be on the lookout for the ones that don’t require you to do a lot. The purpose of humidifiers is very simple, so don't complicate things with a unit that requires a lot of fiddling with just to operate. Look for something simple that gets the job done. That way, you won’t have to waste hours trying to figure out how it works, leaving your little one dry and uncomfortable. You should also look for units that will let you easily control the moisture output. You don’t want to go overboard with the humidity, but you’ll need it to reach the ideal levels at all times, so you need to be able to tweak the settings according to your baby’s needs. Another important trait that the best humidifiers for babies should have is top-notch performance. It should be capable of increasing the moisture in the air inside your child’s bedroom and maintaining it consistently. It should also have a decent size. It shouldn’t take up too much space, but it shouldn’t be too small either, so you don’t have to worry about its capacity to provide ample moisture. A tank that’s too small will also require more refills, making it more of a bother than a helpful tool, so be very particular when it comes to these things. To get more value for your money, you might also want to opt for products that offer extra features and accessories that are very practical in keeping your baby healthy and comfortable. Cleaning brushes, night lights, auto shut-off, and an internal hygrometer will all come in handy. The design can also be a consideration, especially since there are now tons of adorably-styled units available. However, this shouldn’t be the sole deciding factor, as appearances may be deceiving and a simpler model can perform better in many cases. As mentioned above, proper humidity control is highly important. Too much humidity is bad for young kids, as they can invite pathogens like mold and mildew. These will have the opposite effect for kids with sensitive respiratory systems and will even cause regular flare-ups for those with allergies and asthma. Check with your doctor first to see if using a humidifier is safe for your child. Their medical expertise might also be very helpful in choosing the right product for your needs, so if you’re looking into these products to improve your little one’s health, it’s best to seek professional advice first. Make sure to dry the unit completely after cleaning it. Keeping the parts of your humidifier wet and warm will invite mold growth, and you absolutely don’t want that. Clean and dry each part thoroughly to ensure that it won’t harm your little one in any way. Always monitor the humidity levels where the humidifier is located. With the help of a hygrometer, you can easily tell whether the recommended moisture levels have been exceeded. Also, make sure to prevent this from happening again. If you opted for a warm mist humidifier, make sure to keep it out of reach of your little child and ensure its stability so that it won’t fall and cause burns. Keeping a humidifier in your child’s bedroom can be very instrumental in keeping him healthy. However, you have to make sure to choose the right product so you can be sure to get the best results. Hopefully our suggestions help you out in picking the best option for your little one to ensure his good health. I took your advice and brought Vicks Starry Night Cool Moisture for my baby. It runs really well. Mist output is great. My baby always plays with the projection at night. It doesn’t disturb his sleep. It only makes white noise in the background sometimes. It keeps moisturizing my baby’s skin. He doesn’t wake up at night because of the dryness. Thanks to bestforthekids and Vicks.